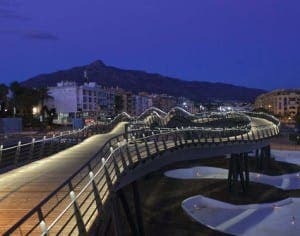 IF proof was needed that San Pedro has stepped out of the shadow of sassy sister Marbella, it’s the town’s head-turning pedestrian bridge. The bridge coupled with the buzzing boulevard has became a focal meeting point for locals; be it families ice-skating on the all-weather artificial ice rink or work colleagues enjoying friday night drinks at one of the boulevard’s swanky watering holes. The bridge itself is more Gehry’s Guggenheim in Bilbao-meets-Calatrava’s City of Arts and Science in Valencia than typically Andaluz. But it has bridged the gap between the former farming community and its glitzier sibling and brought San Pedro screaming into the 21st century. The €85 million tunnel diverting dangerous high-speed traffic below the town centre, an underground car park and the new state-of-the-art boulevard with its amphitheatre, children’s play areas and ample green spaces are other examples of the shiny new image being heavily promoted by the municipality of Marbella, to which the town still belongs. Although perhaps in name only now, rather than in spirit. 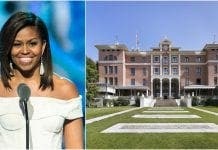 Nowadays, Sanpedreños no longer feel the need to cling onto the Swarovski crystal-studded coat tails of Marbella. They have long called for their own municipality, although as yet to no avail. Nevertheless, the San Pedro success story continues. Plans for a massive new commercial centre on the outskirts of town are now in motion and the beachfront has moved upmarket too. 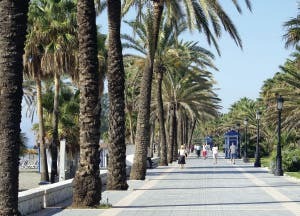 Its swanky new promenade, ornamented with sculptures and water features, can easily compete with Marbella’s elegant elephant beach showers now! With jogging tracks and extended cycle paths, its waterfront piles on the wow factors. The town centre conceals other attractions amidst rows of whitewashed houses, tree-lined roads and shady plazas. Home to the impressive 19th-century Iglesia de San Pedro, the main plaza is laid out as a square within a square: the inner square, dominated by the church, is bordered by statues, benches and water features; the outer square of bars and restaurants look inward on the architecture of a bygone era. It’s a perfect example of how San Pedro subconsciously reflects the greater regional culture of southern Spain, while consciously attempting to be progressive and different. Behind the church, the city flaunts its patriotism with a Spanish flag, hoisted 15 metres into the air behind a statue of Don Manuel Gutierrez de la Concha – the man who set the ball rolling for San Pedro in the 19th century. Gutierrez, an army general, acquired nearly 5,000 acres of agricultural land which extended across Marbella, Benahavis and Estepona in the 1860s and formed the farming colony of San Pedro. As workers arrived from Valencia, Murcia, Granada and Almeria, San Pedro evolved into a sizeable town. Growth came to a standstill during the early 20th century, when Spain was torn apart by civil war. But the town was back in business during the late 1940s and 50s when street lighting was introduced and the main road was built. Independent in spirit if not in practice, a stroll around town – do-able in an hour – shows that San Pedro is very much its own place. Growth may have been less dramatic than that of other tourist towns and cities but the slow-and-steady transformation has allowed San Pedro to cling onto its character. Despite its 21st century additions, it retains the essence of Andalucia other towns lack. It is distinctly Spanish with a friendly feel. It may even be one the last resorts on the Costa del Sol that can rightfully make that claim. But that won’t stop go-ahead San Pedro from planning a racier, rosier future.